The Forest Kingfisher has a dark, royal blue head with pale turquoise on the back.There is a large white spot over the bill. The underparts are white.The male has a white collar which the female lacks. In flight there is a prominent white wing patch.There is a broad black eyestrip extending from the bill to the eye coverts. The tail is royal blue above and below is black to dusky grey. The long, straight bill is black and the lower mandible ('jaw'), which is long and upturned, has a pinkish contrasting strip along the bottom. The eyes are dark brown. The legs and feet are dark brown or dark grey.The eastern race incinctus has a greener back with a smaller white wingspot. Immature birds are slightly duller with forehead and shoulders scalloped faintly white and breast scalloped faintly black. In young males the neck collar is blue mottled and indistinct. The Forest Kingfisher is also known as Macleay's, Blue or Bush Kingfisher. 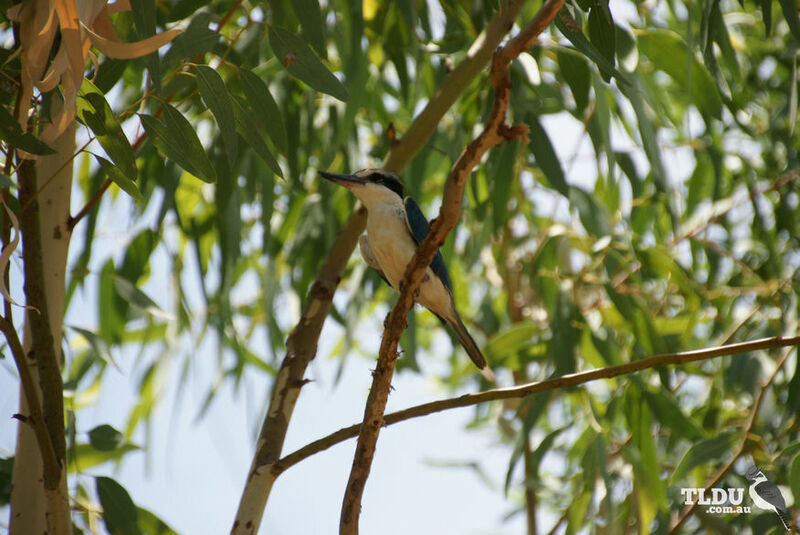 Two species related to the Forest Kingfisher may be similar, however the Collared Kingfisher is larger and greener with no white wing patch, while the Sacred Kingfisher is a little larger with more buff brown underparts and no wing patch. The similarly coloured Little Kingfisher is much smaller and is not often seen. The Forest Kingfisher is essentially a tropical and subtropical kingfisher found from the Top End of Northern Territory to the Gulf Coast. Others are found in coastal eastern Australia from Cape York to the Macleay River in New South Wales. Occasional vagrants are seen further south. Early on in the breeding season, the male Forest Kingfisher explores nest sites or even begins preliminary digging at several sites. The pairs, which may share long-term monogamous bonds, both build the nest. Sometimes the nests are in tree cavities, earthbanks or roots of fallen trees; more often they are in termite nests in trees and they are usually 4 - 12 m above the ground. Each member of a pair flies straight at the nest site from several metres away, with their bills pointed forward like a bullet, chipping away some of the 'cement' with each impact. Eventually a nest chamber about 23 cm in diameter is formed at the end of a short, slightly sloping tunnel. Although the short sloping tunnel helps the nestlings eject their droppings some nests become very soiled. Both sexes, as well as helpers from the previous season, help in the incubationof the eggs as well as feeding the young. It is even possible that in warmer areas the heat of the sun and the termite nest during the day are sufficient for incubation. Both sexes defend the nest vigorously. There is fighting behaviour by the pair at the start of the breeding season defending their territory and during the breeding season the males spend much time perched on a branch, challenging persistently. The fledglings are fed by the adults for at least a month. In some areas there may be two broods per season, but this is rare in the sedentary Top End (far Northern Territory) population.